Power, speed, and integrated radio transmission make the VING V860IIC TTL Li-Ion Flash Kit from Godox a hard-to-beat option for your Canon cameras. Fully compatible with ADI / P-TTL systems, the V860IIN supports many advanced functions and features. Also, it features the Godox 2.4GHz X wireless radio system which provides both master and slave TTL functionality with a range of up to 328'. On top of this, the flash is powerful and versatile, featuring a guide number of 197' at ISO 100 and 200mm along with a zoom range of 20-200mm, which can be expanded to 14mm with the use of the pull-out panel. And, this flash runs off a rechargeable Li-ion battery pack, that ensures fast recharge and long-lasting shoots. For general operation, the V860IIC features full bounce flash capabilities, including tilting from -7 to 90° and rotation left and right 180°. As E-TTL compatible unit, this flash offers support for high-speed sync, flash exposure compensation, 1st and 2nd curtain sync, and much more. Additionally, it can function as an optical master or slave unit if needed. 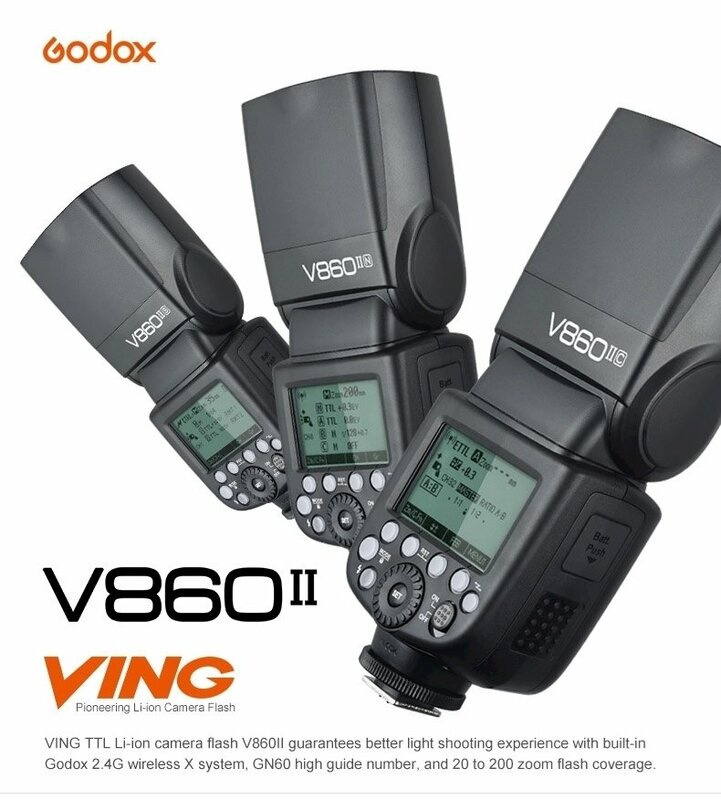 In addition to the hot shoe and wireless triggering, the V860IIC offers a 2.5mm sync port for a wired connection to a camera or receiver.